Coast and Country Crafts and Quilts started as a mobile shop in 2004 travelling around Cornwall and occasionally into Devon & Somerset, making regular visits to village halls & community centres, where Sally “set up shop” for crafters & quilters to come and enjoy browsing and shopping at their leisure. In spring 2008, Coast and Country Crafts and Quilts also established an on-line shop, enabling customers to shop at anytime for all the delightful products that we have to offer. In December 2009 our new Country Store, Coast and Country Crafts & Quilts, opened it’s doors at Cornish Garden Nurseries, Barras Moor Village, Perranarworthal; between Truro and Falmouth on the A39 (accessed from the big lay-by). In 2015 we expanded, taking the whole building and our new opening hours are Monday to Saturday, 10am – 4pm. For those of you with a Sat Nav our postcode is TR3 7PE. We look forward to welcoming you all and helping you to indulge those quilty pleasures……! In addition to the Coast and Country Store, Barras Moor Village offers the added opportunity to extend your visit to sample the delicious food at The Olive Grove, or visit Carol at “Woodland Beauty” and indulge yourself with one of her fantastic beauty treatments and therapies, whilst Cornish Garden Nurseries offers an extensive range of trees, shrubs and plants, specialising in exotics, fruit trees and Christmas trees. For the more adventurous, Barras Moor Village also offers a woodland walk in pretty surroundings. At Coast and Country Crafts & Quilts we specialise in craft & quilt patterns from around the world, with all the accessories you will need to complete them. 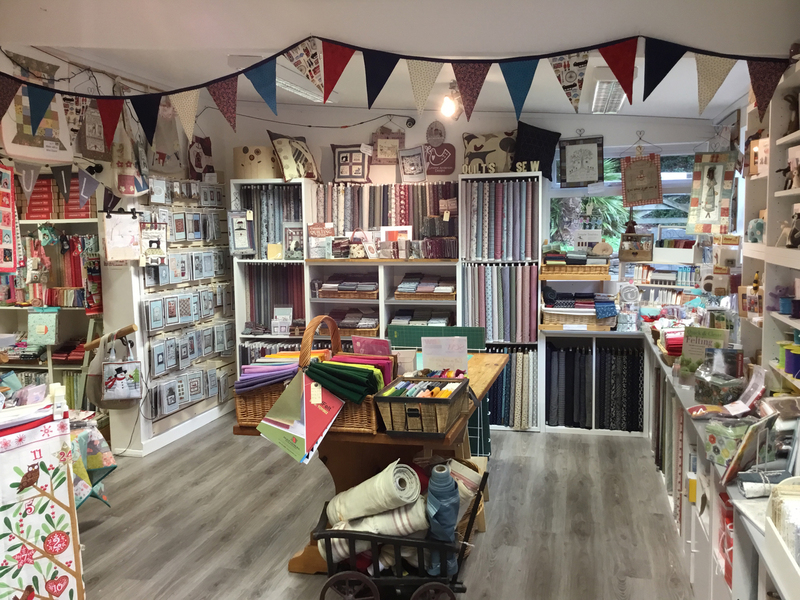 We also sell a delightful range of gorgeous fabrics, books, kits, notions and novelty buttons, dolls & Santa’s hair and accessories, threads, wire hangers of many shapes and sizes; ideal for putting that finishing touch to your project. We offer a fast and efficient mail order service; if the item is in stock we aim to despatch it within 48 hours, or order it for you from our wholesalers if the item is out of stock. We offer a variety of tutored workshops, to suit all tastes and abilities, from a purpose built classroom, within our building, next to our Quilt Shop. A full programme of our forthcoming workshops and events, is available to all newsletter subscribers (just add your name and email at the bottom of any page on the website), or can be viewed on the WORKSHOPS page of the website. This will inform you of what’s new in stock, dates for your diary including workshops, plus what treats are due in over the coming months. Alternatively, if you would like a list of workshops available to Group Bookings, please contact us. In the meantime if you have any questions, please call Sally on 01872-870478.